Aphids in lettuce can be a real nuisance, even a deal breaker when lettuce is when severely infested. Most folks dislike the idea of ingesting a little extra protein in the form of a bug in their salad, and I am no exception. 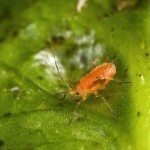 So what are lettuce aphids and is it possible to control lettuce aphids in the garden? Let’s find out. Lettuce aphids come in multiple hues ranging from green to orange to pink. The adults have black markings on their leg joints and antennae. Some have black markings on the abdomen as well, and may be winged or wingless. Lettuce aphid information informs us about their prolific reproduction, which is definitely no boon to the gardener. 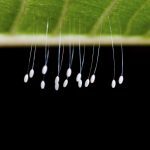 Aphids are both viviparous and parthenogenic, which means the females are capable of producing living offspring without any sexual activity. Just a couple of aphids in lettuce rapidly become an infestation if left unchecked. The problem is how to control lettuce aphids. 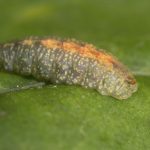 They tend to be difficult to get at, as they are not only well camouflaged, but hide deep in the center of the lettuce on the tender, new leaves in head lettuce types. In loose-leaved varieties, like Butterhead, the insects are more readily apparent and can be viewed on the inner young leaves. You may also see quantities of sticky honeydew and black sooty mildew. Usually, the first thing you read about when controlling aphids is to try to blast them off with a good stream of water. I’ve tried this. Never worked. Okay, maybe it got some of the insects off, but never did much for a true infestation. Next, I usually try spraying either a commercial insecticidal soap or one I have created out of water and a bit of dish soap. This will work somewhat. Better yet, spray with Neem oil, which will give a much better result. Spray in the evening once the sun has gone down, as Neem and insecticidal soap can damage plants in direct sun. Also, this allows the morning dew to wash off the majority of the oil by morning. You can start your lettuce under row covers, which in theory, will work. Of course, if even one aphid gets under there, you could soon have an army sucking away on baby greens. Ladybugs love aphids and can either be purchased or you can plant flowering annuals near the lettuce crop to naturally attract them. Syrphid fly larvae and green lacewing larvae are also connoisseurs of aphids. You can, of course, resort to chemical controls too, but given that this is a food crop, eaten raw no less, I would steer clear. To me, if it gets that bad, I would prefer to rip the plants out and dispose of them. Lastly, keep the area around the lettuce crop weed free to mitigate any other cozy hiding places for lettuce aphids.